A suite of classic Star Wars games, including some of the best Star Wars games ever made, have finally made their way to Steam after launching on GOG earlier this year. The games are available to purchase and download right now, ahead of Star Wars Day on May the 4th. In total, four classic Star Wars games have launched through Steam. The most well known of the four is X-Wing, which is available in a Special Edition that includes the DOS and Windows versions from 1993 and 1998 respectively, alongside the Imperial Pursuit and B-Wing expansions. 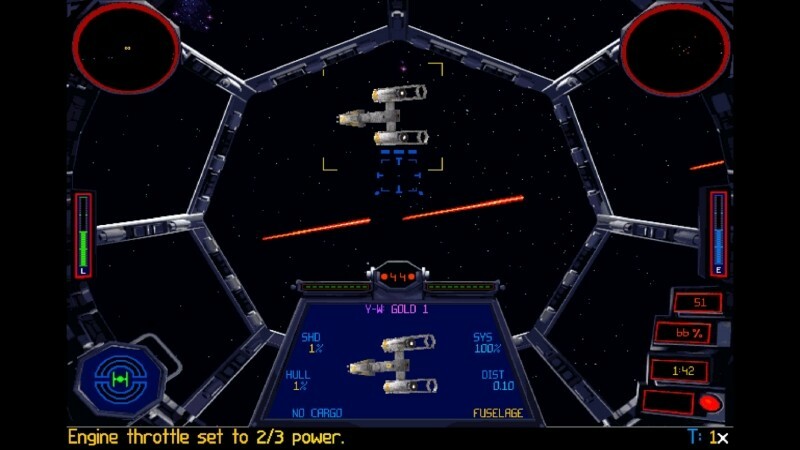 The TIE Fighter Special Edition features the 1994 DOS version and 1998 Windows version, as well as the Defender of the Empire and Enemies of the Empire expansions. 1997's X-Wing vs. Tie Fighter is the third game to launch on Steam, and it includes the Balance of Power expansion. Rounding out the collection is X-Wing Alliance, the 1999 game that never received an expansion. As these games are pretty old now, they will run on basically any modern hardware. The Windows versions of X-Wing and TIE Fighter require a joystick or controller - probably the best way to play the games anyway - but if you fire up the DOS editions you can use a keyboard and mouse. All four games are available individually for $10 each, or together in the $30 Star Wars: X-Wing Bundle. And while you're at it, it might be worth checking out the 2015 Star Wars Collection on Steam, currently just $23, which includes other Star Wars classics including Battlefront II, Jedi Knight, and Knights of the Old Republic.